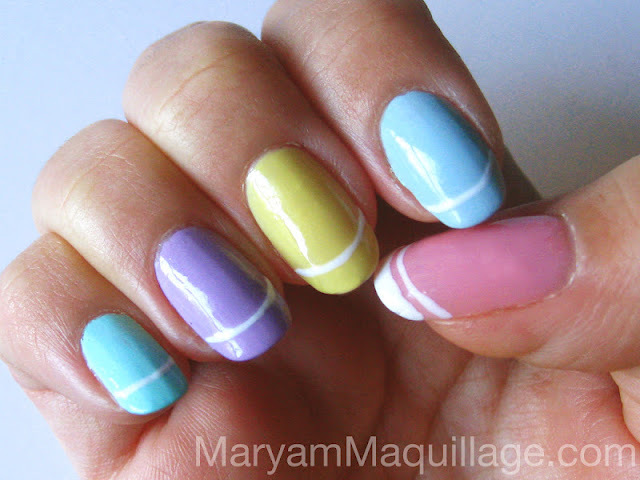 This week I went for a very simple Easter inspired nail design. I've seen way too many fluffy bunnies and very literal interpretations of pastel eggs on the nails throughout the past couple of weeks and although it's all in good fun, I'm just not that into Easter. With that said, I wanted to create something very wearable that merely hints the spirit of the holiday, so I came up with this colorful variation on the French Tip. I chose five pastel nail polishes (two of them I mixed) to create an array of colors on my fingertips. Duri Rejuvacote Base / Top coat -- you can see, it's almost done! Kiss Brush-On Nail Art Paint in White -- used for the thin strips at the root of the tip. This nail polish has a fine brush. The nails look fab, they have a really nice shape to them. This mani looks very stylish and pretty! Love it! Can´t wait to see the Lime Crime products in use. ooooh love your Easter nails happy easter have a wonderful day!!! Aww...so cute! I also used Two of those Sinful Colors nail polishes for my cute Easter nails! I'm loving the pastel craze this season so your nails are adorable. As for Lime Crime, I'm rather jealous. I've been eager to try their products out for a while now! <3 Your nails look like little lovely eggs! Also wow! That seems like a great package from LC. Color can influence our emotions, our actions and how we respond to various people, things and ideas.Pink symbolizes: love, beauty.Yellow symbolizes: wisdom, joy, happiness, intellectual energy.Blue symbolizes: youth, spirituality, truth, peace.Indigo symbolizes: intuition, meditation, deep contemplation. And a combination of all these colors symbolize:sensuousness, sensuality, passion,attraction,desire,love,fervor,zeal,enthusiasm,excitement,glamour, sensational ! That's you Maryam ! Happy Easter ! 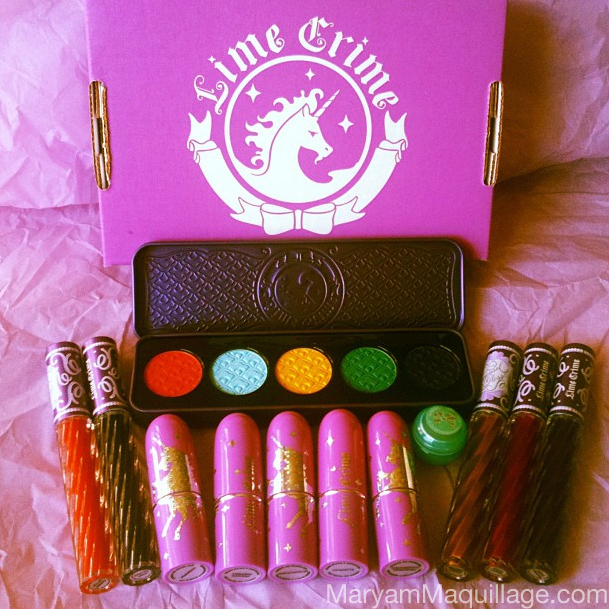 The pastels are gorgeous & I love Lime Crime's packaging! very pretty n colorful n indeed wearable :) Happy Easter !! not at all Tia, I so appreciate it and you!!! Pastel colors make me happy. I love this nail look!!! <3 them! Need to try! thank you so much Anna :)) Happy Easter!! Wooow great nailart, very nice blog! I'm jealous of how you can get your french tip lines so straight. With a fine brush it's really easy, just drag it over :)) Yes, I'm super inspired by the bright Lime Crime colors!! I love how cute and simple this is! LOVE this nail look, so simple! What base coat is your favorite, I really need to grow my nails out! Thanks Imani!! My favorite base coat is the Duri Rejuvacote I mentioned in this post. In fact, it's the only one I use and it also doubles as a top coat. Best nail product of all time, it makes my homemade manicures last 10 days!